If Dragon Age: Origins unfurled the map. Dragon Age II lit the fuse. 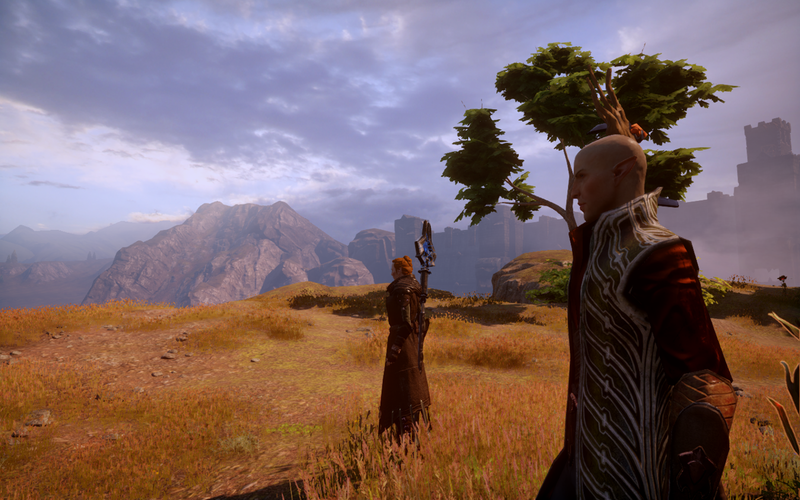 And in Dragon Age; Inquisition, the map is most certainly ablaze. There's a Rift in the sky... and that's not good. Dragon Age: Inquisition starts with a bang. The final events of Dragon Age II—the destruction of the Kirkwall Chantry and the outright bloodshed between the mages and templars—have set off a conflict that is now tearing across Thedas and dividing its people. Magefire by rogue apostates rages through the land, even as their opposing templars have gone equally insane, burning houses, forests, fields and villages in retribution. Worst of all? The one hope of the world for peace—a Conclave where mages and templars were to meet with Divine Justinia (the leader of the Chantry) to negotiate a cease-fire—has just been blasted to smithereens, the Chantry is leaderless, and the sky, too, is now sundered and filled with flame. And that's where we begin... or rather, where our poor hapless Inquisitor steps onto the stage, fleeing out of the Fade from a horde of demons and awakening in a prison cell with partial amnesia, vague memories of a near-death experience, and a mysterious and fiery green mark in the palm of her hand. It's quite literally a hell of an entrance. Meanwhile, my elf's defense of a fellow mage directly led to her conscription by the Grey Wardens and set her on a course that would eventually end in tragedy (as it does for all Grey Wardens), even if she survived the final battle with the Archdemon. Then came Dragon Age II and there again, as in DAO, my female Hawke protagonist was a mage—it felt most appropriate to me for the storyline, although it was kind of hilarious that so few people ever seemed to notice that she was an illegal apostate openly carrying a ginormous magical staff (and, sadly, no templar ever asked her if that was a staff in her pocket or was she just happy to see him, an omission I consider to be seriously tragic). Regardless, as the events of DA2 unfolded over its seven-year span, the tension between mages and templars was no longer simmering just beneath the surface—it was thrumming through an entire city, culminating in a stunning moment of terrorism and irrevocable violence that would touch off a world war. When Dragon Age: Inquisition begins, that war is already underway across Thedas, with mages and templars battling each other openly as well as (even more tragically) abusing and decimating the poor everyday citizens simply trying to stay out of the fray. she'd kill you in your sleep, it's probably for the best. DAI definitely presents a grim world at first—not least because the vast majority of your fights aren't against simplistic baddies like demons or darkspawn (although, yes, you'll fight your share of those). Nope, the most common enemy you'll face this time around is human, whether mage, templar, bandit, or mercenary, and they're all busily fighting and killing and dying in the ferment even as they ignore the fact that the skies above them are raining demons and boiling a livid green. It's a surprisingly believable scenario—okay, not the demon-raining part, but the one in which people squabble over trivialities and vanities, ignoring the fact that the world is falling down around them. And this is the world your protagonist enters. 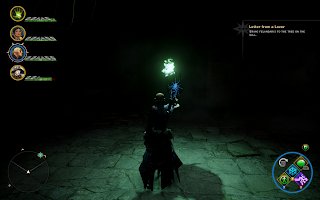 Imprisoned and held for questioning at first because of the strange circumstances of your survival by two familiar faces (a returning Cassandra Pentaghast and Leliana, and it's so nice to see them again! ), you'll have to allay their suspicions, join them in a journey to Haven, and begin to show them what kind of a hero you will (or won't) be. 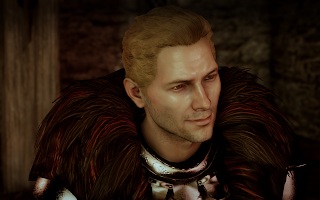 You're quickly joined on this journey by a returning Varric Tethras (now with even more glorious chest hair), along with a quiet elven mage apostate named Solas, and in true Dragon Age fashion, within 15 minutes, you're already asked to make tough choices—do you take the mountain path and potentially rescue the lost scouts? Or do you charge directly to the Temple? Either way, it's clear that there will be some casualties. The quests and storylines of DAI remain accessible and thematically tied together thanks to a brilliant new innovation in the game called the War Table. With the War Table, the Inquisitor will periodically interact with the advisors while addressing a variety of quests, political measures or favors, and world events. Each one of these can be resolved in a variety of ways (and time-frames), with each outcome dependent on the advisor you chose. 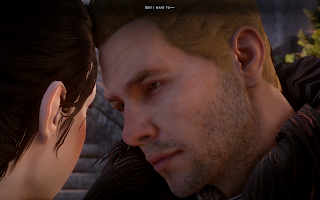 For instance, Josephine's resolutions tend to be diplomatic and nonviolent, while Cullen would simply like to send in some troops to stomp their way through the problems, and Leliana, by far the coldest and most bloodthirsty, is perfectly happy to maim, kidnap or assassinate as needed, unless you hold her back. socialization but who cares. Look at him. For example, in response to a rather trivial matter in which a rival bard is saying unkind things about our own tavern bard, Maryden, Leliana coolly notes that "A minstrel with no tongue can tell no lies." (This was the point at which I actually yelled at my computer screen: "LELIANA! What HAPPENED to you?") Let's just say the sweet little bard of Dragon Age: Origins is gone, and it's all more than a little tragic—she's now a terrifying, secretive and complex woman with icewater in her veins. Even if (reassuringly) she at least still adores and raises nugs (the adorable little rabbit-pig creatures you find across Thedas). As you carry out your missions and assignments from the War Table and on behalf of your advisors, meanwhile, your team of potential Companions continues to grow. 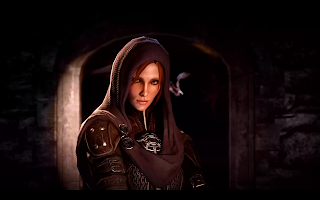 In addition to Varric, Solas and Cassandra, you will also have the opportunity to meet and add such characters as The Iron Bull (a big, brash Qunari mercenary captain who's much more than meets the eye), court enchanter Vivienne, Red Jenny rogue leader Sera, dashing Dorian, the gentle and mysterious Cole, and solitary Grey Warden Blackwall. These nine Companions will accompany you on your quests across Ferelden and Orlais, and are your Inquisitor's potential friends, enemies, and lovers, along with Josie and Cullen (and there was much rejoicing). Varric, however, still has a crush on that darned crossbow of his, so he's unromanceable, as is Cole (who is too innocent and vulnerable for the task), and Vivienne, who is the mistress of a powerful Duke. But everyone else? 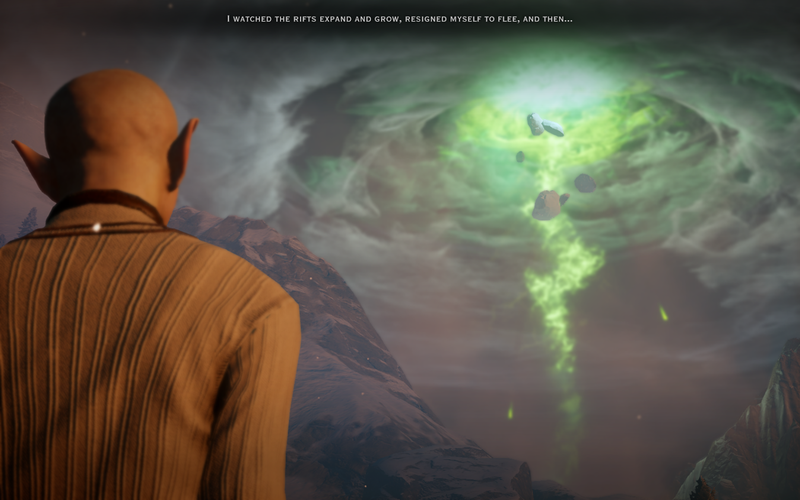 Fair game, and those romances add immeasurably, as always, to the texture, atmosphere and story of Dragon Age: Inquisition. they didn't kill you first. As your efforts to help restore order to the world begin to have a tangible effect on Ferelden's landscape, you'll soon have the opportunity to view more than death, destruction, and chaos. Increasingly revealed in each new location you discover, the beauty of Ferelden and Orlais within Dragon Age: Inquisition's open world is frequently staggering, bringing you vistas as varied as the mountains and streams of the Hinterlands, the gorgeously inclement Storm Coast, the vibrant Orlesian city Val Royeaux, the tragic verdant loveliness of The Emerald Graves, the elegant winterscapes of Emprise du Lyon, the desolate swamplands of The Fallow Mire, the endless sands of The Hissing Wastes and The Western Approach, and many more. And Dragon Age: Inquisition's Open World concept means that you can explore these vast areas to your heart's content, ferreting out secrets and finding new opportunities for treasure or lore as the opportunities arise. Please check out the second part of my initial look at DAI to follow. And please do check out my Twitter feed at @DrunkDalish. Thanks!